Luis Peralta of Passaic sliced nearly a second off his US#1 time in the 600-meter run and the Randolph girls moved back to the top of the state rankings in the distance medley relay at Saturday's New Balance Games at the 168th Street Armory in New York. Peralta, who announced his commitment to the University of Oregon earlier this week, ran a sizzling 1:19.14 to win the three-lapper and move into No. 14 on the all-time U.S. list. Peralta, who came into the meet with a nation-leading 1:20.09, is still #3 all-time in N.J, but he inched closer to the state record and former national record of 1:17.9, which was set in 2005 by Shaquan Brown of Paterson Kennedy. Brown's 1:17.9 stood as the national record for seven years. Clayton Parros of Seton Hall Prep, the state record holder in the 400 outdoors, is No. 2 all-time in NJ history with the 1:18.90 he ran in 2009. 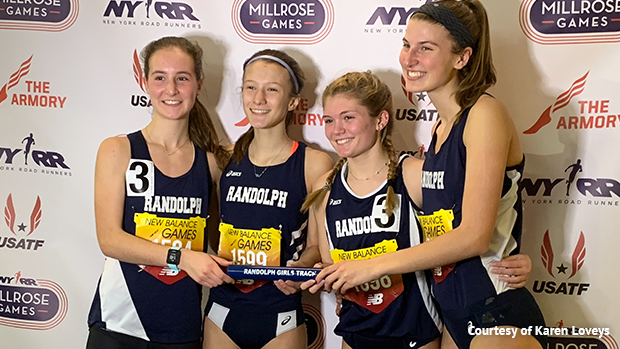 The Randolph girls, who decided to compete after the State Group 4 Relays scheduled for tomorrow were postponed until Wednesday, reclaimed its spot as the fastest DMR team in the state with a victory in a NJ#1 US#3 12:08.76. The Rams received splits of 3:43.87 from junior Meredith Finley, 61.73 from sophomore Chloe Whiting, 2:29.92 from freshman Maya Wilkins, and 4:53.25 from Princeton-bound Abby Loveys, who got the baton five seconds behind in fourth place before mounting her comeback. All four runners for Randolph ran indoor PR's. The Lawrenceville boys, with a 1:55.74 anchor from Robert Enck, dropped a huge time in the sprint medley relay, crossing the line first in a NJ#2 US#4 3:33.66. Bergen Catholic was second in a NJ#4 3:34.63. Lawrenceville's 3:33.66 is just behind the state leading 3:33.46 SMR run by St. Benedict's Prep at the Essex County Relays on Jan. 2. In other NJ highlights, John McGovern of Somerville captured the boys 2-mile in 9:32.17, which is NJ#2 including converted 3,200 times, and Micheal Dua of Don Bosco ran a NJ#5 9:34.12 to place second to McGovern. Paul VI won the girls shuttle hurdles in 34.74. Sydney Woods of Demarest, who is NJ#1/US#5 at 13-0 3/4, placed second in the girls pole vault at 12-6. Corina Vidal of Henry Hudson placed second in the girls 1,000 in a NJ #2 2:57.77. Pope John's Charles Dasilva placed second in the boys 1000 in 2:33.67, and Pingry's Nicole Vanasse was third in the girls mile in 5:06.92, and Kaylee Stenderowicz finished second in the girls triple jump with a NJ#4 37-10.